Five miles from Chief Mike Medicine Shield Taffe’s house in Mehoopany, across the Susquehanna, is the Procter & Gamble plant that the Starks cited as a huge job provider in the area. At that time of the company’s 1997 “Environmental Management Case Study,” it was the largest P&G facility in the world. Before it became Procter & Gamble Paper Products Company in 1976, the plant existed as a facility for Charmin Paper Products, which moved into the Wyoming Valley in 1966 to capitalize on the area’s forest resources and lure workers from the declining coal mining industry. When I overshot Mike Taffe’s house, I ended up in the parking lot of a Dandy Mini-Mart, which sits just short of the intersection where Route 87 meets Route 187. There, Route 187 continues north, and 87 turns aside to cross the Susquehanna toward a sprawling gray industrial complex that, from the road, is engulfed by a parking lot occupied by a sea of cars. Mike Taffe’s house is tucked behind an old fire station. He had described a two-story yellow house behind a fire station, but he didn’t tell me that the fire station looked more like an uninhabited barn, or that the white hall between the fire station and the junction of 87 and 187 crouched in the back of a cracked parking lot where grass and tall, spindly weeds broke the asphalt and widened the crevices in its pockmarked face. I found it difficult to match buildings to Chief Mike’s descriptions because, in this river town from which the river is not even visible, so many of the buildings are derelict and faded, glum shells with dark eyes or, in many cases, no features at all. I realize now that, outside of my experience of neat towns in the immediate suburbs of thriving, tidy cities, there exist specimens of rural America that are grim, neglected, truly isolated, so that they are no longer quaint and instead somehow severe. It betrays my privilege to confess this. In my town, there is one street lined with stately Victorian homes, churches whose spires give downtown, in the summer haze, the appearance of a murky, crenellated heaven, a pricey café in the place of a bygone ice cream shop, and a gift store named for a mystical creature said to have haunted the valley in the nineteenth century. Splitting off from Main Street, there are roads leading to a bustling school complex hemmed with playgrounds and playing fields, a small library with forest green rafters next to a stately brick building where I used to go to kindergarten, and a rippling blanket of fields interrupted by housing developments, but also embroidered with farmland, little houses, and, in the right season, wildflowers. 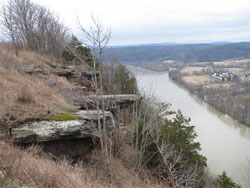 In the northeast corner of Sullivan County and the swath of Wyoming County where 87 winds toward the river, the road first threading gently over undulating hills and then, plunging into forest, climbing and diving, the landscape draws the eye over its contours, onto rounded crests of yellow-green hills and into creases saturated with the greenest black. The towns, though, struck me as oddly stark. They seemed empty. Traffic was the main feature of them. They resisted marketable cuteness. They were not the kind of places that would be promoted as wonderful places to live. They simply were places where people had lived, built their houses, drank their coffee, raised their children. They were permeated with the evidence of human habitation that wears and ages a place rather than engineering it for consumption. When I pulled into Mike Taffe’s driveway, John Decker was standing where the pavement met gravel, waiting to greet me. He smiled and jerked his hand in a short wave. Mike Taffe had invited John and his daughter, Marie, both of whom had been adopted into EDN, to join my discussion with him. We all sat around the kitchen table. Marie poured coffee and lifted the cellophane from a bowl of brownies. Chief Mike said that EDN leased its land to Chesapeake because Chesapeake could drill underneath their property without their knowledge, even if they declined to sign a lease. He said that since Chesapeake would siphon off their natural gas no matter what their stance on drilling, EDN might as well sign a lease and make a profit. He laughed again, and everyone else followed. Then he shrugged, suddenly more serious, explaining. Chief Mike and Marie drew on their cigarettes, Chief Mike tapping the end of the cylinder on the ashtray, Marie using her forefinger to flick away bits of ash. John Decker broke the silence. I had stood on the Rocks and seen the well pads across the river, with twisting brown dirt roads dotted with tractors and trucks carrying water. He said he was almost certain that Chesapeake was the company with which EDN had signed a lease. He knew because Chesapeake sent him a letter asking to lease his property in Mehoopany at about the same time Mollie Eliot, EDN’s secretary, who lives in Troy, received the letter inquiring about the Prayer Rocks property. “It’s all Chesapeake up in Bradford County,” Marie said. “I’m almost certain it’s Chesapeake,” Chief Mike said. Chief Mike and the Deckers said that, when Procter & Gamble built on the property across the river, no one bothered to find out whether they would be disturbing grave sites. “And even when they do repatriate the bones, you don’t see half the stuff that was taken out of those,” said Chief Mike.